The saddest stories among those who owe some of the $1.3 trillion in student loan debt are those of college dropouts. They took out loans to go to school, hoping for a better life. But without college degrees, many don’t find good jobs to help pay back these loans. It not only ruins their lives, it’s terrible for the nation’s budget. The loans are financed by the federal government, ultimately leaving taxpayers on the hook. Which schools are leaving taxpayers and students in the lurch most often? I ran some calculations, using the latest data, released in September. The U.S. Department of Education’s College Scorecard tracks the number of students who dropped out with debt for each college and university in the nation. My figures show a total of 3.9 million undergraduates with federal student loan debt dropped out during fiscal years 2015 and 2016 (from mid-2014 through mid-2016). I found that more than 900,000 of these students dropped out of for-profit universities. That’s 23 percent of all the indebted dropouts, even though only 10 percent of all undergraduate students attend for-profit schools. Many more indebted dropouts, almost 2.5 million of them, had attended public institutions, such as two-year community colleges and four-year state schools. But the public sector’s share of dropouts exactly matches its share of the student population: 64 percent. As a whole, private nonprofit colleges seem to be doing a better job, accounting for 13 percent of the dropouts while educating a quarter of all U.S. undergraduates. 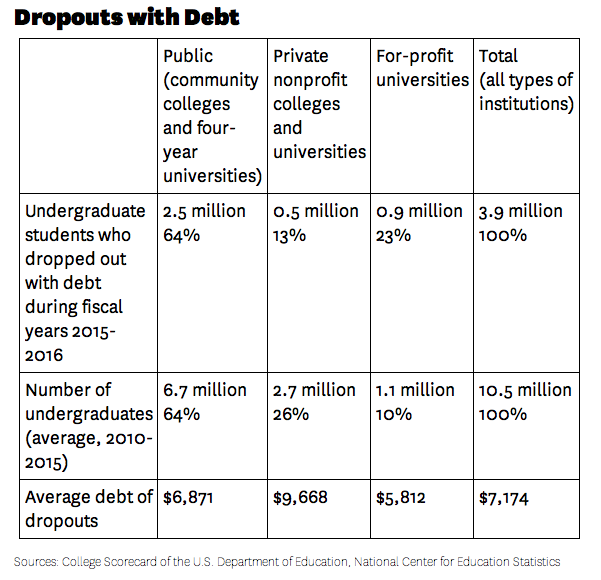 However, the size of the debts of dropouts is the largest at private nonprofit colleges, with each person owing almost $10,000 on average. “The federal government provides these loans, and the students interpret that as a stamp of approval. 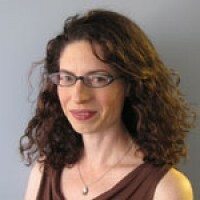 They assume that the federal government wouldn’t give them money to go to an institution that doesn’t graduate its students,” added Baum, the author of the 2016 book Student Debt: Rhetoric and Realities of Higher Education Financing. One shortcoming of the data is that it doesn’t tell us exactly what percentage of students who took out student loans are dropping out each year and eventually defaulting. Instead, all we are given is how many students with loans dropped out over two years from fiscal 2015 to 2016. We don’t know, at first glance, if they represent a lot or a little of the student body. It’s possible to see a surge in dropouts during good economic times when employers are hiring and students are quitting school to enter the workforce. Some may have initially started school recently; some may have started 10 years ago. Not every student who withdraws from college is a dropout for life. Some transfer to other colleges and eventually obtain degrees. This is particularly true for many community college students, and this data doesn’t reveal which students eventually get degrees. For some institutions, which have high tuition and cater to a low-income population, students with loans make up a large percentage of the student body. For these colleges, this data gives a good overall picture of how many people are failing and succeeding in graduating. For more elite institutions, where the proportion of people who take out loans is small, it’s important to remember that the number of dropouts covers only students who take out loans. The college might have a better track record graduating wealthier students. That also explains why private, nonprofit schools produced a smaller number of indebted dropouts than for-profit or public institutions; they tend to cater to a wealthier student population. I decided to focus on sheer numbers of people, as opposed to dollar amounts of debt, because previous research has shown that small debts can be the biggest problem. Over 65 percent of defaulters had student loan debt under $10,000 and the default rate is highest for people with the smallest loans, those of less than $5,000, according to the College Board. Out of curiosity, I ranked colleges by the numbers of students with debt who had withdrawn from school prior to graduation. 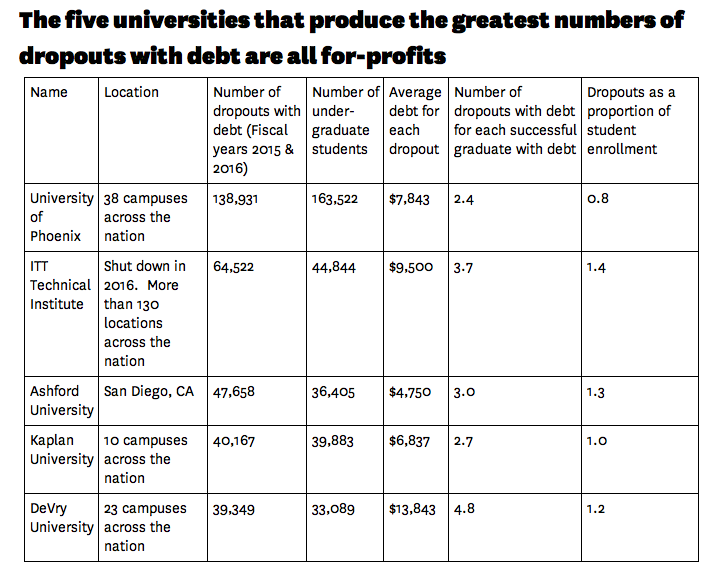 The top five were all for-profit institutions. 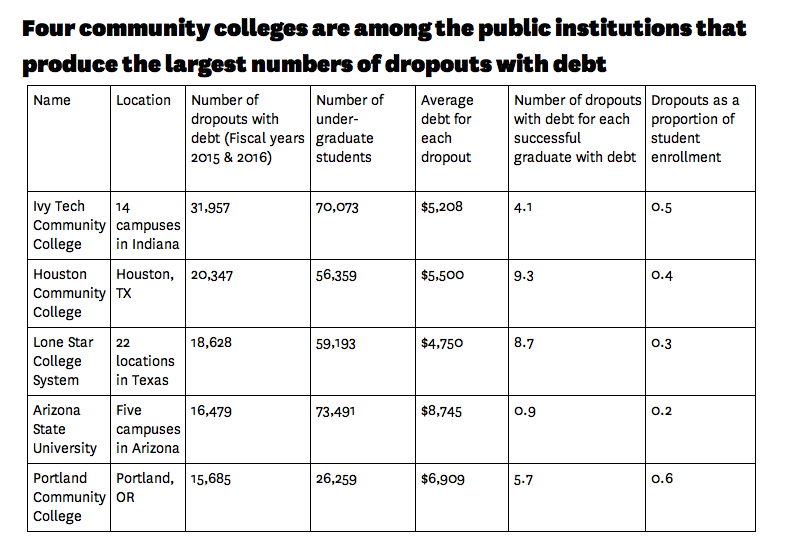 Collectively, the five produced more than 330,000 indebted dropouts over two years. The largest, the University of Phoenix, produced almost 140,000 of them. The College Scorecard data also shows that these dropouts are likely to have trouble repaying the loans. Among students who dropped out of the University of Phoenix three years earlier, 79 percent were unable to repay a single dollar of principal on their federal student loans. A big problem with this approach is that it points the finger at large institutions. The University of Phoenix has more than 160,000 undergraduates in 38 campuses across the United States. You’d expect the school to have a large number of dropouts. There are many smaller schools that have fewer dropouts but a higher percentage of their student body drops out. To put these large numbers into perspective, I created a “dropouts as a proportion of student enrollment” ratio in the tables below. It attempts to adjust the two-year dropout figures for school size. The lower the number, the better. A number of 1 for this ratio means that roughly half the student population drops out with debt each year. Of the top five, the University of Phoenix had the best record, with only 40 percent of its population dropping out with debt each year. 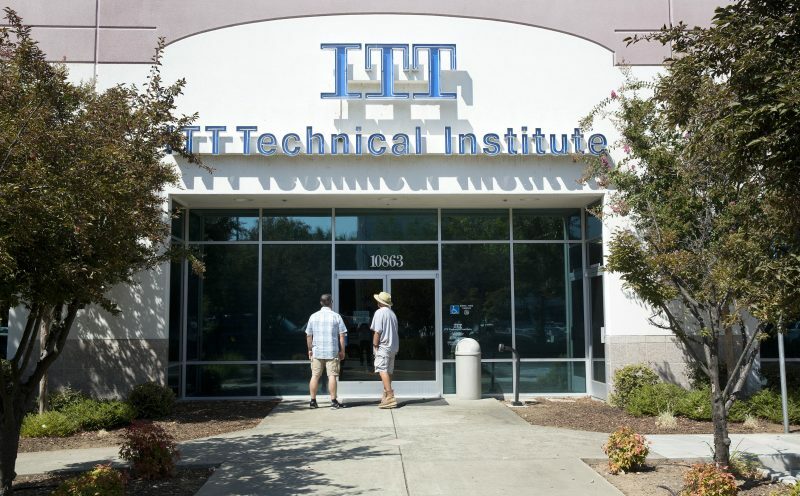 At ITT Technical Institute, which closed down last year, 70 percent of its population dropped out with debt annually. 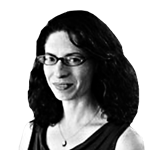 The downside to this ratio is that it penalizes schools that cater to low-income students. The poorer the student population, the larger the ratio of dropouts to student body will be. It also overstates the dropout problem for schools whose enrollments are declining, which is happening throughout higher education, but particularly at for-profit schools. Another approach is to compare how many dropouts with debt a college produces for each successful graduate with debt. 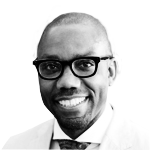 “It’s important to highlight colleges who have a lot of students who drop out with debt relative to those who graduate — particularly for low-income students,” said Robert Kelchen, a professor at Seton Hall University who researches higher education finance. Through this lens, the University of Phoenix had the best record among the top five producers of dropouts. It generated 2.4 dropouts for each person who successfully graduated during 2015 and 2016. By contrast, DeVry University, another large for-profit chain, produced double that number, or 4.8 dropouts for each successful graduate. 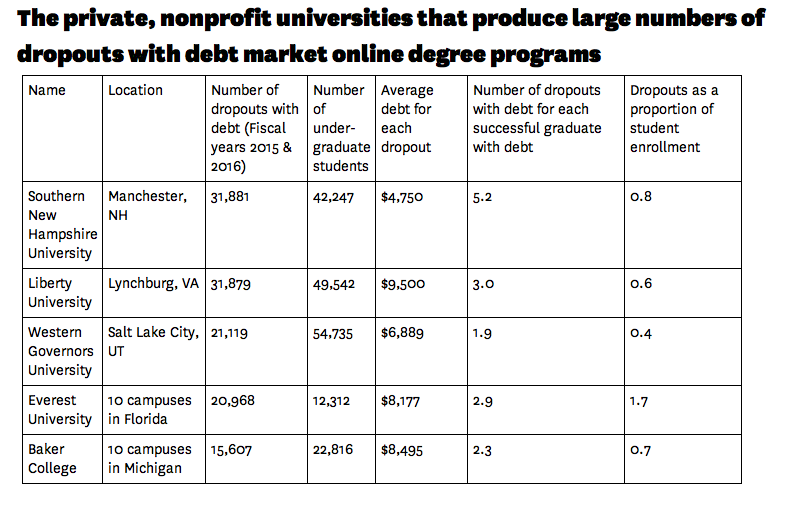 Again out of curiosity, I created top five lists for both public and private, non-profit institutions, identifying which colleges and universities produced the largest numbers of people who dropped out with debt. Collectively, the top five public institutions produced over 100,000 of these students over two years. Four of the five are community colleges, where graduation rates are notoriously low. However, many students use community colleges to start their college educations and purposely withdraw before graduation to transfer to a four-year school. The only four-year school on the top five public list is Arizona State University, a very large school with more than 70,000 undergraduates. It also admits many low-income students. It was startling to see how much better its ratios are than in the for-profit sector. It produces more graduates than dropouts and only 10 percent of its population drops out with debt each year.